From coffee makers to thermostats to irrigation systems, PIC microcontrollers (MCU) are at the heart of millions of embedded applications. As developers migrate next-generation PIC MCU-based applications to the cloud, they must overcome complexities associated with communications protocols, security and hardware compatibility. To accelerate the development of these applications, Microchip Technology announced a new Internet of Things (IoT) rapid development board for Google Cloud IoT Core that combines a low-power PIC microcontroller (MCU), Crypto Authentication secure element IC and fully certified Wi-Fi network controller. The solution provides a simple way to connect and secure PIC MCU-based applications, removing the added time, cost and security vulnerabilities that come with large software frameworks and real-time operating systems (RTOS). Once connected, Google Cloud IoT Core provides powerful data and analytics to help designers make better, smarter products. 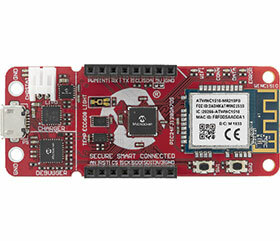 As part of Microchip’s extended partnership with Google Cloud, the PIC-IoT WG development board enables PIC MCU designers to easily add cloud connectivity to next-generation products using a free online portal at www.PIC-IoT.com. Once connected, developers can use Microchip’s MPLAB Code Configurator (MCC) development tool to develop, debug and customise their application. The board combines smart, connected and secure devices to enable designers to create connected applications in minutes.